‘Digging for Victory’ – Turfs up!! 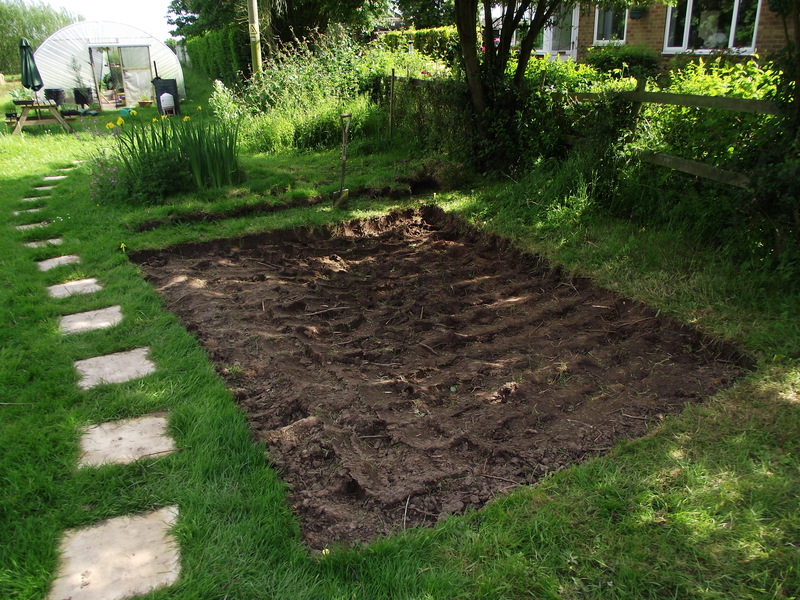 After a hot day working with the spade – I have finally taken all the turf of the area for the pond. I reckon that was the hard part – I am now about 10-15cm down – deepest depth I want to get to is about 40-50 cm, with 2 stepped shelves along the sides for plants, and a ramp down to the deepest end at the far end in this picture. The ramp is for stupid hedgehogs who may fall in and need a way out…. There are a few roots but nothing to worry about. Fen soil is so clean I have only found 2 stones so far, both probably dropped there in the midst of time. Originally the Fens were a wetland, and a lot of place names around here include ‘marsh’ in the name. In fact where I live I have an old map of about the early 1600’s which just states ‘marshland’ over the area I live. Over the centuries, starting with the Romans (an old roman flood wall is only a mile away) the Fens have been drained to create the perfect agricultural land. A stone less soil of loam which in places is jet black, which when you see whole fields like this is quite visually stunning. Sadly industrialised agriculture is losing this soil quite quickly – during the summer you can see the wind whipping up whirl winds of soil dust, blowing the beautiful soil off to the sea. We can’t spray our way out of this problem I fear. I’m hoping to spend Thursday digging the hole!! 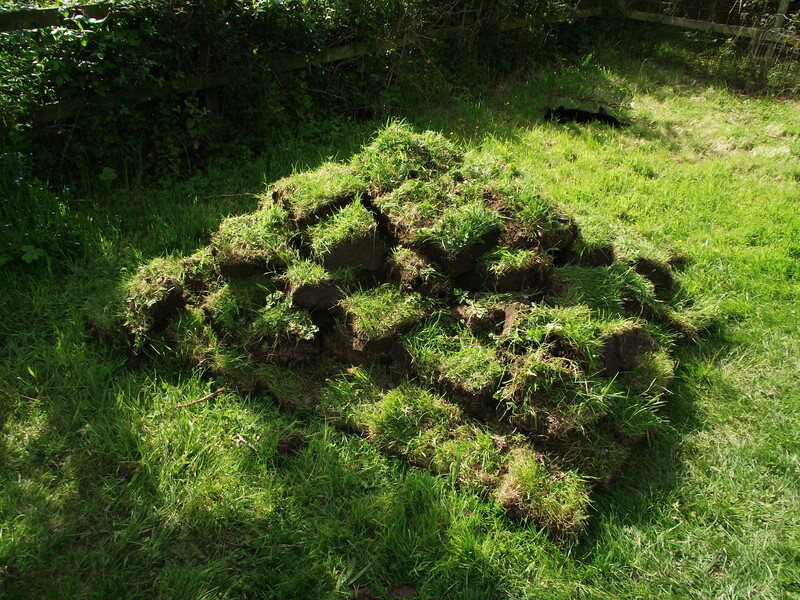 Some of the turfs I took up – these will be used to put round the pond edge to cover the liner. For half the work this afternoon I had some ‘assistance’ – The Boy, who came out and lounged about in the sun!! It’s a good life.